Bill Nye the Science Guy is firing back at conservative talk radio host Rush Limbaugh, who last week on his show proclaimed Nye is nothing more than a talking head on television. "Bill Nye is not a science guy; that's why he's a TV personality," Limbaugh said after Nye appeared on Piers Morgan Live to discuss tornadoes. "Bill Nye is not a scientist. 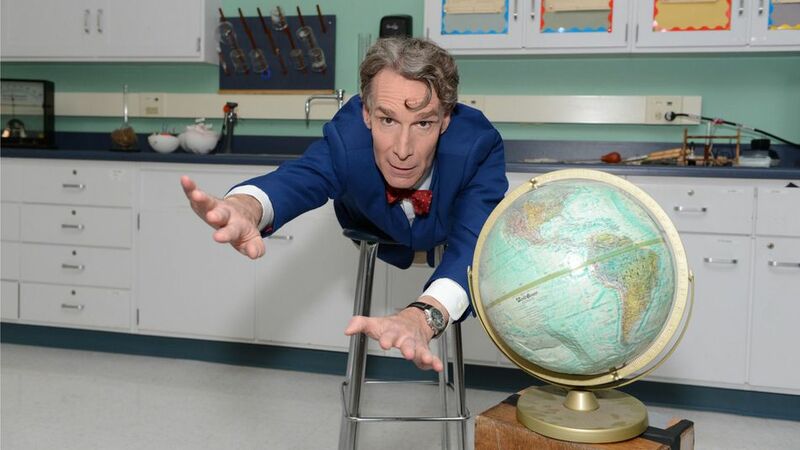 Bill Nye can explain to kids things like surface tension, why you can fill a glass above the rim and it won't fall over if it's just the right amount. He explains things like that, surface tension. He's not a scientist. He knows it, and everybody else knows it. Doesn't matter." During a candid interview with Mashable, Nye addressed the remarks — unprompted. "When Rush Limbaugh says I'm not a scientist, I'm charmed — I smirk," Nye said. "Rush, I think you got it wrong. But I've got to tell you I don't follow Rush's comments that closely. I don't hang on his every word." This is the first time Nye has commented publicly on Limbaugh's statement. "I was very flattered last week, and I meant to tweet about this, but I dropped the ball because of the holiday weekend," Nye added. "I got a Google Alert for it and it was one of those things where I thought I should do something. ... What am I if I'm not a scientist?" Mashable also spoke with Nye about social media's role in science, the Internet versus flying cars, Carmen Electra, Kickstarter, how to pronounce "GIF" and much more. Nye will take part in a Reddit "Ask Me Anything" session June 4 at 1 p.m. ET. Mashable: How do you keep people interested in science in the age of social media? Nye: It's easier than ever for those who have access to the digital world. One of the concerns is where you have poor people or people who aren't connected technologically to the Internet. […] You can engage millions of people with a few keystrokes rather than sending tons of mail or whispering in millions of ears. It's fantastic. But the information you get from social media is not a substitute for academic discipline at all. You've applied multiple times to be a NASA astronaut. Do you still want to be one? Well, sure. But there are a few things that happen to you as you get to be older. You don't see as well. You pull hamstring muscles. And you're less likely to be chosen by conventional government needs. I'm also not successful enough and don't feel like I should spend $200,000 on a plane ticket to go to sub-orbital flight, straight up and straight down. But if the price comes down, I'll go, heck yeah. Would you ever bring back your TV show, Bill Nye the Science Guy? Let me start by saying it's the 20th anniversary of The Science Guy show this fall. Disney is launching a Science Guy app for the anniversary. I would love to do the show again. Give me a call. Right now, I'm the CEO of The Planetary Society, and we educate people about space science constantly. The reason I took this job is that I had Carl Sagan for astronomy. I joined the society in 1980 and I've been a member ever since. You once corrected someone who pronounced "gigawatt" as "jigowatt." The inventor of the Graphics Interchange Format told the world this month at The Webby Awards that GIF is pronounced with a soft "g," as in "jif." Your thoughts? He's working with an acronym in English, and that's fine. Back then, I was talking about the traditions of science. One of the drawbacks of English is you can't spell things by hearing them. I would prefer that he would prefer "gif," but who am I to judge. I am but a simple user. You recently tweeted a photo with your high school science teacher. What important life lessons did you learn from him, Carl Sagan and your parents? Can you explain the phrase you included in the tweet, "Let your life speak"? That's an adage from a Quaker guy, and it's consistent with the two things my father instilled in us: Every person is responsible for his or her own actions, and leave the world better than you found it. That was certainly a goal for me. My current motto or the phrase that's associated with me so strongly is "change the world. I prepared a document in 1992 to give to everybody who worked on [The Science Guy] show. We had 300 people over the years because these interns would come through all the time. The first thing it said was, "Objective: Change the world." That's the goal. For me, I wanted to get as many scientifically literate people coming of age as possible so we would have better transportation systems, better use of energy and be the world leader in human rights. That phrase carries a lot for me. And consistent for me is "Let your life speak." In other words, I've done what I can with my actions to show the world what's important to me and what I hope is important to all of us. Last year, you used Kickstarter to try to fund an aeronautics game. It didn't reach its funding goal, but did that kill the project? That ended up getting funded by the National Science Foundation. Although the Kickstarter campaign didn't kick the start, perhaps it raised awareness with The Man or the powers that be, and that lead to its success getting funded. We don't have flying cars, but we have the Internet. Which would you rather have? I kind of rather would have the Internet. You just don't know where it's going to lead. It's really an important time to be alive because of climate change, because of the rate of change in the human population — and now that everyone's aware that we can get hit by an asteroid, we can do something about it. What famous scientist, dead or alive, would you want to have dinner with? If I can use the term "scientist," I'd like to have dinner with Steve Martin. Now, is he a scientist? His comedy promoted science and critical thinking. Does that make him a scientist? I don't know. Otherwise, if it has to be a scientist, it would be Michael Faraday. He changed the world completely. He discovered the relationship between electricity and magnetism and the motion of the magnetic field and electric field, which allowed you and me to have this conversation right now. His insight and understanding of force fields was, in general, more complete than anyone else's — ever. You were the scientific expert on BattleBots. Did you watch Syfy's Robot Combat League this year? No, I just saw the trailer. […] But I was replaced [on BattleBots] by Carmen Electra. Carmen Electra, I think by most people's standards, was what they call nowadays as smoking hot. So my scientific expertise was supplanted for a little different viewpoint, which I completely understand because I know the demographic of that show. Young males. I don't have a favorite. They're so diverse. The ones about human nature are more interesting to me than the ones about technology. What I love about TEDtalks in general is the inherently optimistic viewpoint. That's really valuable. I'd go with Star Trek not just because it had some respect for physics, but also because it carried with it the very optimistic view that the future is better — and humankind will use technology for the betterment of mankind.